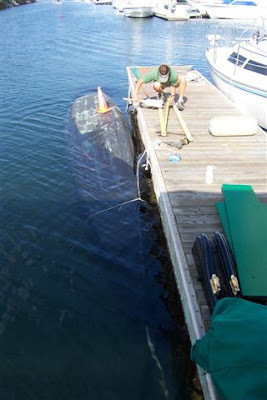 the other day I mentioned that there were some who would admit and others who would deny having sunken boats. 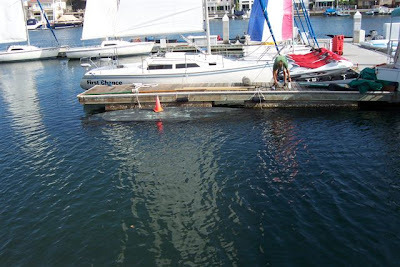 The next morning, Sean had sent me an e-mail with photos of his own from Coronado, California. Kinda looks like a small whale. The traffic cone is a nice touch. He explained that it was a deliberate sinking in order to prevent termites (a clever idea, I might add). 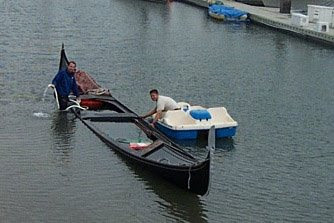 "People look at me pretty funny when I drop a bilge pump into the bay and put the hose into the boat"
Here are a couple photos from a more exciting swamping that took place years ago, with Valentine's Day only two days away. Sometimes you've just got to soak the wood. Really, of all the swamping photos I've seen, this is by far the best. Clever use of a pedal boat. 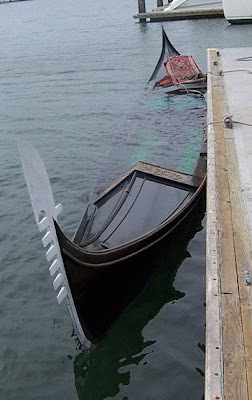 This was the first time I had a boat swamped and I remember thinking, "How am I going to get the whole bay out of the boat?" Man! I know what you mean Sean. It would have to be intentional. I didn't think you could sink one. People used to ask me if they tip over easily. Then I'd walk along the edge and say "No, nearly impossible".